The night sky shimmers in the moonlight and just beneath is the sea of city lights in its riotous disarray. 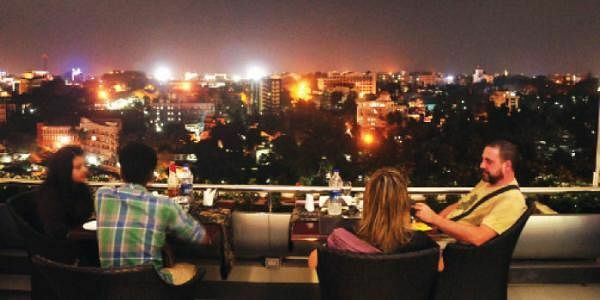 The first thing you gawk at the newly opened rooftop restaurant, ‘In High Spirits’ on the 13th floor of SP Grand Days, is the spectacular skyline. Overlooking the busy street and brightly-lit billboards the place will easily put you at ease. The ambiance is chic and the layout roomy. The accent is on soft and earthy hues with a touch of greenery here and there. It’s definitely a haunt where you can sit peacefully sipping your drink listening to the dying city hubbub. We settle in a corner still drinking in the gorgeous view as the balmy evening breeze sashays in and the music starts playing. Menu is pretty elaborate and Jomon T Thomas, the chef, enlightens us that it’s ‘fusion cuisine’ which accommodates almost all food varieties. We are served a basket of pepper pappads along with a sour, orange tinted welcome drink which we later identify as tomato shorba. Apart from the rooftop regulars like sizzlers and kababs you will find a whole array of items ranging from kappa and mulagu to Kung Pao chicken. The chef recommends the mixed grill platter. Served on a sizzler plate it has chicken tikka, seekh kabab, reshmi kabab, fish tikka, tandoori shrimp and paneer tikka. “We are trying to come out with a bunch of signature grilled items which seems to be a hot favourite of our patrons,” says the chef. There are a number of seafood specials too - chemeen porichathu, crab masala, meen moliee and fried masala squid rings. Most of the items on the ‘Anglo Indian Delights’ section sounds interesting. Railway Mutton Curry is a dish straight out of the colonial kitchen. “Prepared mainly with boneless lamb and potato it used to be a specialty of the British Raj dining cars,” says the chef. Tandoor Grilled Scampi Green Masala is shrimps dipped and marinated in a paste of curry leaf, green chillies and lemon juice. Another item, the Dak Bungalow Murghi Roast, turns out to be whole tandoori chicken marinated in a mix of lemon juice, ginger, garlic, turmeric and herbs, roasted in oven and served in sizzler plates. You can also go for Nanjil Thuppackey Fry which is whole leg of chicken marinated and deep fat fried. Most of the Indian breads are available along with various biryani varieties. Chef Special Cocktail Biryani is another highlight - fragrant Basmati rice cooked with succulent pieces of chicken, lamb, shrimp, assorted seasonal vegetables and topped with nuts. You can wind up the dinner picking anything from the long list of desserts. ‘In High Spirits’ is not a place you rush all famished and ready to gulp down anything. Food will take time in arriving as you are served freshly-cooked items only. The restaurant opens at 7 pm.